CoD: Modern Warfare 4 is under development? We all know that this year's Call of Duty has a definite name - Ghosts - but most of the series' fans were waiting for something different. After the very successful Call of Duty: Modern Warfare 3 the gamers were hoping to get the continuation, and it seems that MW4 is really under development. This information is not official, but the rumors look rather trustworthy. It is a well-known fact the Call of Duty series is being developed in several studios. One of them - Sledgehammer Games - is the producer of the previous MW. The user from Playst4tion community published an interesting screenshot that shows the LinkedIn profile of an artist from Sledgehammer Games. 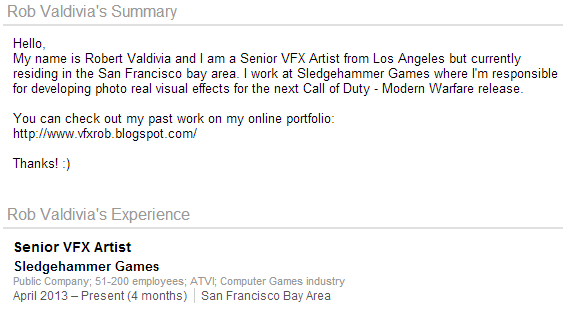 On the picture this guy mentions that he is working on "photo real visual effects" in CoD: MW. This artist was hired to the studio in April 2013, so he is obviously talking about Modern Warfare 4. Of course, this information is only a rumor, but at least now we have got a little hope that Call of Duty: Modern Warfare 4 will be released this or next year. Are you waiting for MW4 or Call of Duty: Ghosts will be better? Write your opinion in the comments below.